An IGAD LPI meeting with officials and experts from the Kenyan National Bureau of Statistics focuses on the importance of employing and sharing evidence-based data and information to enhance the profile of livestock at the national budgetary systems. Explaining the ongoing efforts of IGAD LPI to have the livestock sector receive better representation in the national planning and accounts in all IGAD member states, Dr Abdi Jama stressed the need to further promote the culture and the practice of livestock information sharing across government, and the role of NGOs, CBOs and international organizations in helping help policy makers realise the potential of livestock for economic development and poverty eradication. Mr Patrick M. Mwaniki, a senior manager for agriculture and livestock sector statistics at KNBS, mentioned that the technical committee of his unit is keen to work with IGAD LPI in sharing livestock related data and information and looks forward to exploring the level of representation of the livestock sector in the national accounts. 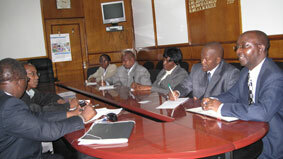 The IGAD LPI team had also paid a courtesy visit H.E. Aden Bare Duale, Assistant Minister of Livestock Development along the Kenyan country team members to update him on project activities and achievement.